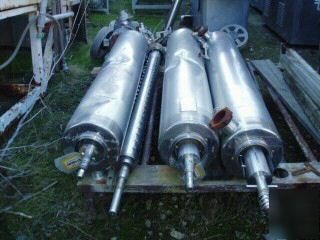 Delaval/Contherm scraped surface heat exchangers, model 6 x 9, 6" x 72" with the barrels being stainless steel, nickel clad, 9 square feet, each is equipped with a 10 hp v-belt drive, cip, barrels are rated at 450 psi @ 315 degrees c., jacketed for 225 psi, new 1981, condition good, last used for fruit juice. Exterior of barrel is stainless steel, interior is nickel clad, blades are plastic and units are horizontal. Barrel serial nos. 3557fcb (85), c1981ncn (81).